There might not be another team in the NHL with as much anticipation to start the season as the Edmonton Oilers. Languishing at the bottom of the standings over the past three years with finishes of 30th, 30th, 29th, Oiler fans are ready for the team to make their move. Obviously the silver lining to finishing so low is the blue chip young talent that one is able to acquire and in the Oilers case, three number one draft picks in Taylor Hall (2010), Ryan Nugent-Hopkins (2011) and Nail Yakupov (2012). Add in a budding superstar in Jordan Eberle and a goaltender just entering his prime in Devan Dubnyk and the makings of a bright future are there. Steve Tambellini and the brass also made another splash this offseason in signing the much sought after college free agent Justin Schultz. He has yet to play an NHL game but if he shows even some of the skills on display in the AHL over the last few months, the signing will be a success. They also hired/promoted a new head coach, naming former Renney assistant and Swiss National Team coach Ralph Krueger the new Oilers bench boss. Krueger is known as an excellent motivator and has been highly praised for his work and relationship with the Oilers younger players. This is the year Edmonton wants to make their move from the basement and into competition for a playoff spot. With 11 players off the roster playing regularly over the lockout, be it in the AHL or Europe, the Oilers are hoping that gives them an advantage out of the blocks. The trademark of the team and will be among the most exciting to watch in the NHL this season. They return last year’s top line of Taylor Hall, Ryan Nugent-Hopkins and Jordan Eberle, a line which is the envy of most teams in the league. They are young, talented, have great chemistry. More importantly for this season, they’ve been playing together most of the year in Oklahoma City already. Krueger will look to give the trio more ice time and responsibility this season and maximize their effectiveness. 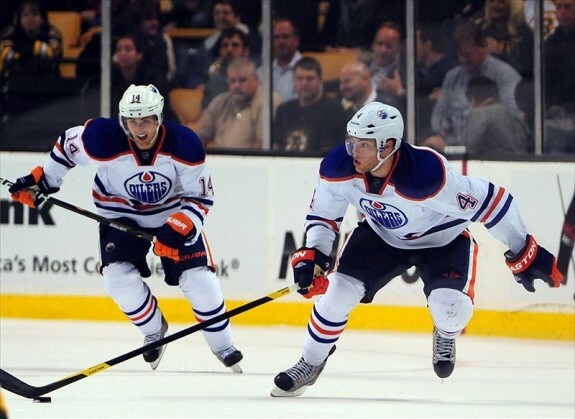 The fact they’ve already been playing together could give the Oilers an edge to start the season. The addition of Russian sniper Nail Yakupov gives the Oilers one of the more dynamic second lines in the league. It looks as though to start the year, Yakupov will move to the left side and play on a line with Sam Gagner and Ales Hemsky. There may be no more talented, yet equally as enigmatic second line trio in the league. They possess elite skill, but inconsistency has plagued the careers of Gagner and Hemsky, and Yakupov, while supremely talented, is still somewhat of an unknown. If they can put points up, look for Edmonton to be playing with the lead a lot. A very effective line that was formed in the second half of last season was a veteran third line of Ryan Smyth, Shawn Horcoff and Ryan Jones. They killed penalties, played against the other teams top line and were on the ice in tight situations. That line will look to play a similar role this year. Jones is injured to start the season, however, so it looks like Teemu Hartikainen will take his place on the right side to start. Look for Jones to be re-united when he returns healthy. A gritty, solid checking fourth line in Eric Belanger flanked by Ben Eager and Lennart Petrell will be heavy on the fore check and bring some needed energy. A group that has been much maligned in years past, a lot of the criticism was well earned. They lacked a true puck-mover and power play guy, and on many nights were not tough enough and were pushed around. The team looked to address these needs with the signing of Justin Schultz and recent trade for Mark Fistric. Schultz will be looked upon to bring some of the offence he showed in OKC and get the puck up to the explosive forward group. A key to the defence will be the health of Ryan Whitney. When healthy he can be a big cog in the wheel. He can move the puck, has great awareness and is able to play in all situations. The problem is that he has been rarely healthy. All indications are that he is in great shape to start the season, so fingers crossed. The one bright spot last season was the emergence of a top shutdown pair in Ladislav Smid and Jeff Petry. Smid has turned into one of the league’s better defenceman and Petry took giant steps forward last year in his play and confidence, and was the team’s ice time leader most nights in the second half. They will look to have the same role this season and take yet another step in their development. A steady influence on the back-end, veteran Nick Schultz is a perfect complement to the other Schultz. A solid, stay at home defenceman who rarely has any glaring mistakes, looks to be paired with Justin Schultz to start the year. Rounding out the group is newly acquired Fistric who is a tough, heavy hitting defenceman, and returnees Corey Potter and Theo Peckham, who is nursing an injury at the moment. These three will compete for the 6th and 7th spots on the depth chart. There are many question marks with the group, but as long as it stays healthy it is much improved from last season. If Whitney can stay healthy and Justin Schultz can put up some points on the backend, they are good enough to help the Oilers compete for the playoffs. Another potential question mark for the Oilers, and the question that has been asked repeatedly over the past couple years; is Devan Dubnyk a #1 NHL goaltender? The 26 year old Regina native has played 101 games for the Oilers in his young career posting a goals against of 2.85 and save percentage of .910 in those games. Not spectacular but not bad either. Considering those numbers came while playing behind a last place team, not bad at all. Dubnyk is also just entering his prime, and the former first round pick has all the tools to be a top guy. The key is now putting it together consistently for a full season. Dubnyk was also stellar playing for Canada at the recent Spengler Cup, backstopping them to a gold medal. He also beat out top goaltending prospect for the number one job. Coming in as his backup to start the year is veteran Nikolai Khabibulin. Oft injured and past his prime, Khabibulin will provide an experienced second option for the Oilers. No longer able to carry the load, Khabibulin could however, have value in a shortened season. In the case of any injuries, look for last year’s Baron’s MVP Yann Danis to join the big club. SPECIAL TEAMS: The power play could and should be extremely dangerous. The group was the third ranked unit in the NHL last year and there’s no reason to think it won’t be just as good if not better this season. The top unit in training camp so far has Hall, Eberle, Nugent-Hopkins and Justin Schultz, with Shawn Horcoff and Teemu Hartikainen both taking turns in the other spot. The top unit was deadly last year and the addition of Schultz can only help. Not to mention the OKC first unit PP this season was those first four names along with Hartikainen as the net presence. They have been ripping it up already for three months, chemistry shouldn’t be an issue. As if that wasn’t enough, the second unit is potent as well. It consists of Sam Gagner, Ales Hemsky, Ryan Smyth, Nail Yakupov and Ryan Whitney, with Gagner manning the point with Whitney. That is a group that could rival many teams top units. The penalty kill, while improved, is not nearly as good. Ranked in the middle of the pack at 14th last season, it was inconsistent on many nights. The multitude of injuries also played a factor in that regard. On defence Smid and Petry also did a good job last year and having the steady Nick Schultz for a full season will benefit. The addition of Fistric will also be a big improvement. Last year’s top forwards on the PK were Horcoff, Smyth, Belanger and Petrell. All play the role well, but had their moments of inconsistency last year. 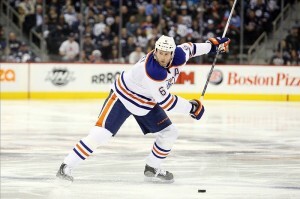 Also look for some of the top forwards such as Jordan Eberle get a shot at more PK time. 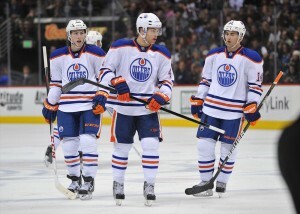 BREAKOUT PLAYER: Ryan Nugent-Hopkins. His arrival on the scene last year was a breakout in itself, and if not for a late season injury, RNH would likely have been the Calder Trophy winner. At just 19 he is the undisputed top centre on the squad and will be a main catalyst for the offence. He’s a little stronger, a little more experienced and a little more mature than last season. If he just takes a natural step forward in his sophomore season he could be a top point producer in the league in no time. Especially since there are two 30+ goal scorers playing on either side of him. BOUNCE BACK PLAYER: Shawn Horcoff. A disappointing season where he had just 34 points and was a -23, the Oilers need more from their captain and leader. No longer a top line player, Horcoff will centre the third line, but will still be a key piece of the lineup. He will be counted on for important face-offs, killing penalties and playing against the other team’s top players. He will also get PP time and chances to be a point producer. If Horcoff can bounce back and have a good year, it will go along way in the Oilers playoff chances. ROOKIES TO WATCH: The big name additions in this group are Justin Schultz and Nail Yakupov, and for good reason. Schultz has been lighting it up in OKC and looks like the real deal. Oiler fans are eagerly awaiting his debut. His defensive zone play may be a work in progress but his offence isn’t and his addition to the PP could be huge. 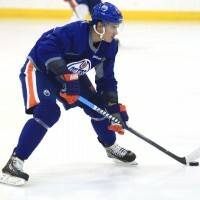 Yakupov, the #1 overall pick is one of the most dynamic and electrifying players to come around in some time. He has the ability to bring fans out of their seats and put up goals in bunches.The other name to watch is Teemu Hartikainen. Having already had a taste of the NHL, the Finnish winger is hoping to stick full time this season. Having a good year in the AHL, he could be the power forward the Oilers are looking for. He should also get some PP time with the first unit. X-FACTOR: Devan Dubnyk. The team will be as successful as the goaltending takes them. The offence will be good and will put up points and the defence does not have a long way to go to be improved. Dubnyk however, is the wild card. If he steps up and grabs hold of the number one role and runs with it, it improves the Oilers chances dramatically. Not only will it allow the team to play with more confidence but also allow them to take more chances on the rush. Dubnyk is in a great situation to succeed and a opportunity to take hold of in front of him. The Oilers are hoping he takes a stranglehold on it. BOTTOM LINE: The talent is unquestionably there, it might be a couple of years away from competing for a Stanley Cup, but it is certainly there. The Oilers have toiled in the NHL cellar for long enough and this year are poised to make their way out of it. There are certainly question marks throughout the roster, but overall the team is much improved from last year. Another year of maturity from the young players and adding elite, albeit unproven, talent in Yakupov and Schultz can’t hurt. 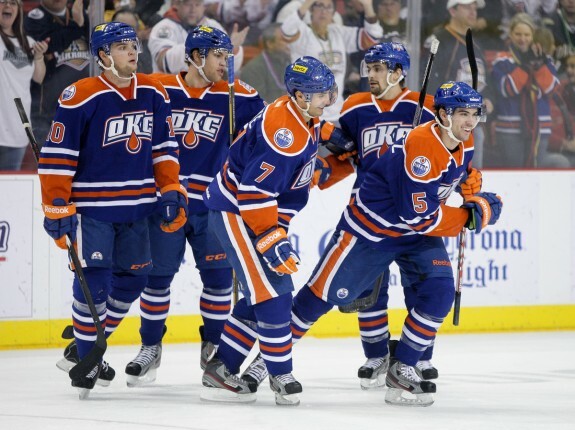 The shortened season may play into the Oilers favour, with many players already playing together in OKC, coach Ralph Krueger is hoping the team’s young legs can get them out to a fast start in a season which is certainly more a sprint than a marathon this year. The Edmonton Oilers want to compete for a playoff spot this year and ultimately take the next step in what they hope is a team that will be in the playoffs and competing for a Cup in years to come.